​Finding someone’s email is one of the most frustrating things I’ve had to learn. It’s simple but it can get complicated when you don’t know where to look at. At first, I would search on contact pages but it wasn’t always advertised. Most of the time it’s not visible because it invites scrapers (spammers) to find your email address and add you to annoying email lists. I learned from my mistake, Ok? ​What can I do if I still can’t find an email address? ​Here's a checklist you can use to find someone's email. There's no opt-in, all I ask in return is for you to share the post on Twitter. Click here to get the checklist. ​There are 3.7 billion e-mail users in the world as of 2017. Being able to find someone’s email addresses is essential to any online business. 59% of B2B marketers say email is their most effective channel for revenue generation. ExactTarget says that for B2C 77% of people prefer to get permission-based promotional messages via email (versus direct mail, text, phone, or social media). But none of that will matter if you can’t talk to them first. This is what you could do by following this guide. ​The about page is a common place for companies to share who their staff is and the role they have in the company. Additionally, you can find their contact details. It means you can find their name, role in the company, social profiles, and email address. If you want to contact specific people in a company, then this page is a goldmine for you. It will help you find and contact the right person. You won’t have to guess. Scroll down the company's about page until you find the person you want to reach out to and get their contact details. ​You would think that by having the name “contact” you’d be able to find all the information necessary on that page. But that’s not always the case. Many people don’t share their email address and some don’t even have a contact form. Isn’t that the whole purpose of the page? To share a way for people to easily reach out to you? I can’t get mad at them, though. ​And similar variations. To speed up the process, hold “CTRL” + “F” ─when you are on the contact page─ and then search for the [at] variations. It should help you find their email faster. This is especially useful for content heavy contact pages (too much text). 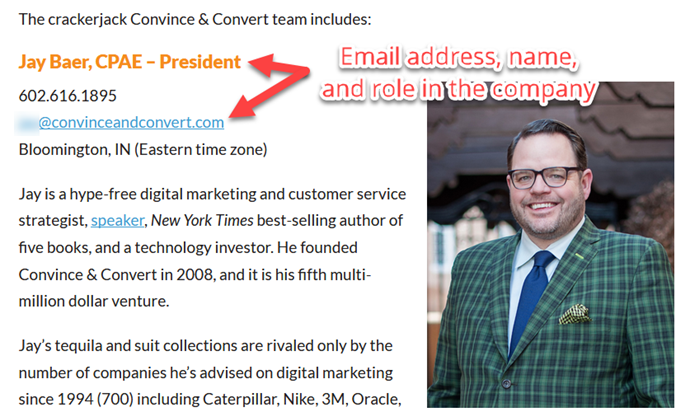 ​Sometimes you’ll see email addresses on the header or footer of the page. But most of the time it’s a generic address like “info@domain.com” or “contact@domain.com”. If that’s the case, save it in your list but I wouldn’t make it my first option. If anything, it would be the last one because they usually go to assistants. Assistants usually have instructions to filter "unwanted emails". Yours could be skipped and they’ll never read it. ​This is where it becomes a bit technical. If after checking the previous pages you still can’t find it, revisit them but this time look at the source code. You do it by right-clicking on the page and then select the “source code” option. That will open the HTML code for the page. Then hold “CTRL” + “F” to open the “find in content” search bar. To open the HTML page, "right-click" anywhere on the page and then click on "view page source". ​After that, all you have to do is type @their-domain.com to show all mentions of possible email addresses. After the HTML page opens, type "CTRL" + "F" on your keyboard and run your search to find the email address. 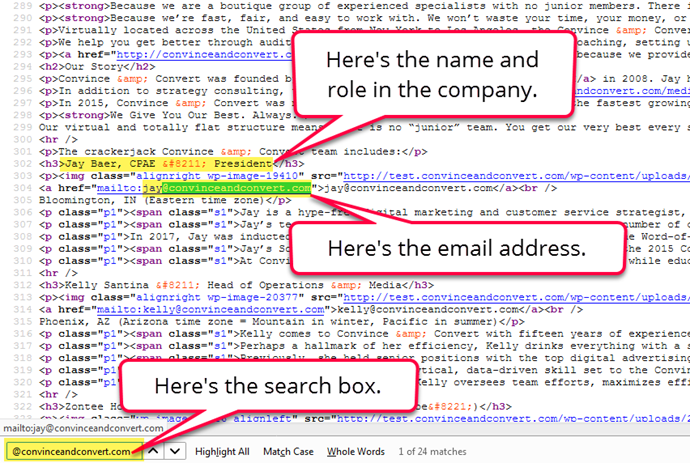 ​We do this because sometimes people cover their email as a link and the only thing you can see is their name. Something we see a call to action but in the code it says “mailto:their-email@their-domain.com”. You can find most email addresses on (and through) a website. If you can't, you aren't being through. ​As of today, there are 2 billion monthly active users on Facebook, 1 billion monthly active users on Instagram, 303 million monthly active users on LinkedIn, and 335 million monthly active users on Twitter. That’s a lot of people, right? Now, think about them willingly sharing a bunch of their personal information. It’d be awesome, right? The reality is that people do it every day and we can find like-minded people thanks to them being vocal about it. With the right approach, we can find the information we want. And with a bit of effort, we can get to know them better before we reach out. If you want to get better conversions in your emails, make sure to check this email outreach guide. ​Twitter is my favorite social platform because with the right search operators we can find pretty much anything we want. Use Twitter to your advantage and find their email address. ​It’s not as common as it used to be but a few people use the cover image to share their email address. Just take a quick glance and see if it’s there. When you check their Twitter profile make sure to take a quick glance at their Twitter cover. Sometimes you'll find their email there. ​Another option is to look in the Twitter bio. You’ll find some addresses there. Many people choose to share their email in their Twitter bio so take a peek and see if it's there. ​Go to TweetDeck and log in with your Twitter account. ​Click on the upper left part to start a new search (below the blue Tweet button). ​Type in the following search. If you can’t find their email, try adding another popular email service. If you still can’t find it, move on to the next method. If you can't find their email address with these searches then try a different platform. ​Facebook isn’t my favorite but it’s without a doubt the most used one and as such it’s a wealth of information. Now, as far as I know, the only way to find someone’s email address on Facebook is to get it via business pages. 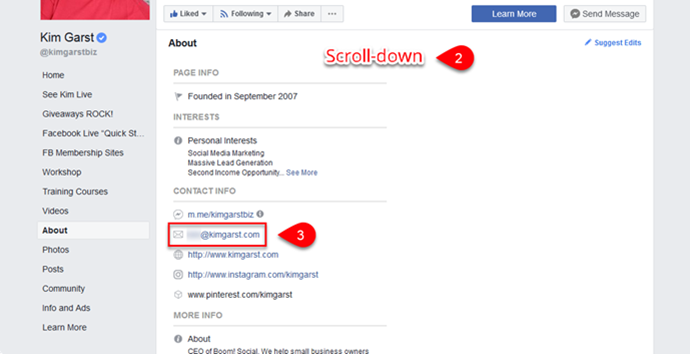 ​When you visit a person/business’ page, look at the menu on the left. You’ll see it under the picture. Look for the “About” option and click on it. 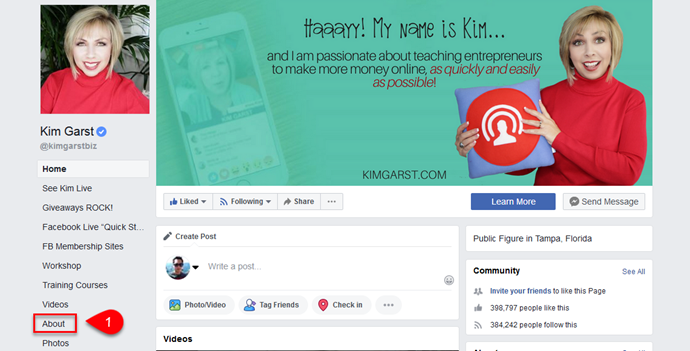 Not many people think about all the information Facebook shares in their pages, embrace the opportunity to find their email. In my experience you'll find people's email here but if the page is a company's then you'll likely find a support or info email. Try a different platform if so. When you are on Instagram take a quick look at the bio. You might find their email there. ​This one is unique to mobile because that button will not appear on your desktop. By the way, it’s only available for business profiles. What I recommend is to use your phone when checking Instagram, that way you’ll save some time. To find an email address on Instagram all you have to do is tap on the "email" button in someone's profile. ​Did you know that you can find someone's email address on Instagram? All you have to do is to click on the "email" button in a business' profile. ​Most people on LinkedIn are there to find business or new opportunities and they’ll share their email to be contacted. Search for their email in the summary and if you can’t find it, try the contact details. You don't always need to connect with people to find their email. Just check their LinkedIn summary. ​To see people’s contact information you need to first connect with them. Then you’ll be able to see their email address. ​Go to their LinkedIn profile and click on “see contact info”. This is only available for first degree connections so make sure to connect with them first. Whatever you do; do NOT add people to email lists they never asked to be on. ​This is something I came across when doing research for this post and I have to say it’s AWESOME. Why didn’t I think of that? You’ll need email permutator and Chrome’s LinkedIn sales navigator extension. Click on the video below to see how it works. ​There are some people who share their email address in the video description. But it’s rare so just take a peek if you are watching their videos. If not then skip to the about page. ​If the owner the channel has a business or does partnerships of some kind, you’ll be able to find an email. ​Go to their channel and click on “about”. To find an email address on YouTube, go to the user's channel. ​Scroll down a bit and under details click on “view email address”. Click on view email and tick the box. 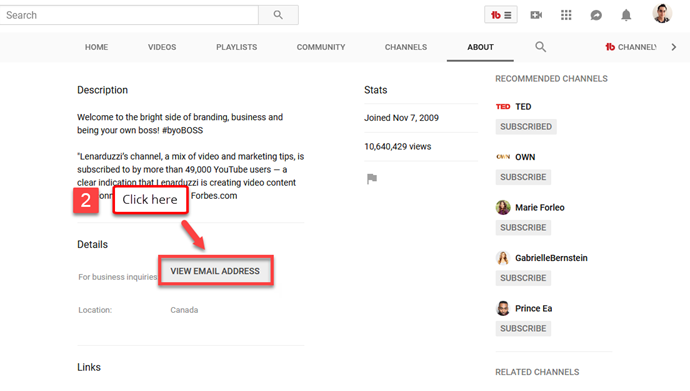 Did you know that you can find someone's email address on ​YouTube? ​To find it, go to the channel's home page and click on "about", then scroll down a bit and under "details" click on view email address. ​The following search operators are the ones I use to find emails in Google. I don’t think you’ll need more but if you want to learn about them in detail, refer to this article. 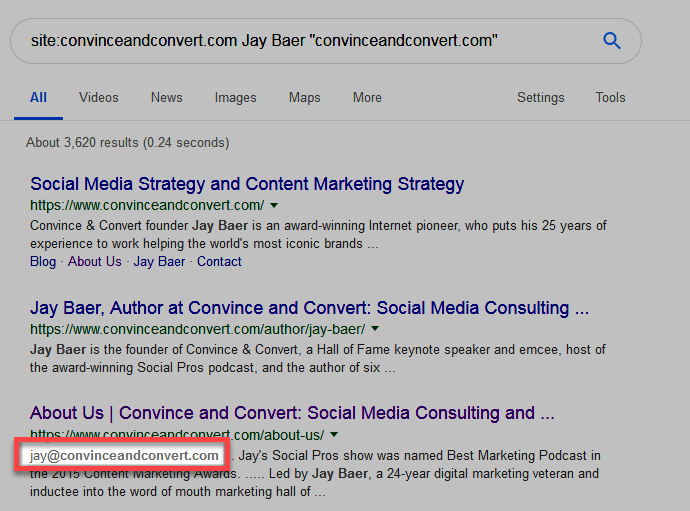 Use the Google search operators mentioned above to find someone's email via advanced search. ​Quick note: If you decide to search for tweets in Google that’s fine. But understand that not every tweet is indexed so there’s a chance you won’t be able to find their email. For better odds use TweetDeck as mentioned here (click to jump back to that section). Did you know that you can find someone's email address via Google? All you have to do is use the search operator ​site:their-domain name "their-domain"
​It’s unlikely but it’s possible that even after trying every single method described in this guide, you won’t be able to find it. There are many reasons for that but don’t fret, you can use other tools. ​Hunter is the tool I use and trust. The first 100 requests (domain search, email finder, and/or email verification) per month are free, after that, you have to upgrade for more. It’s $49 USD per month for up to 1,000 monthly searches or $39 if you pay yearly. Play the video below to see Hunter in action. ​An alternative to Hunter is VoilaNorbert because it works in pretty much the same way but in my experience, it’s more reliable. The downside, however, is the fact that Norbert only gives us 45 free credits to test and after that, you ​have to pay. Their pricing is “pay as you go” ($0.10 per lead) or a plan like the “valet” for $39 USD per month paid yearly or $49 paid monthly. You get up to 1,000 leads per month, unlimited members for your team and credit rollover (credits you don’t use are added to the next period). 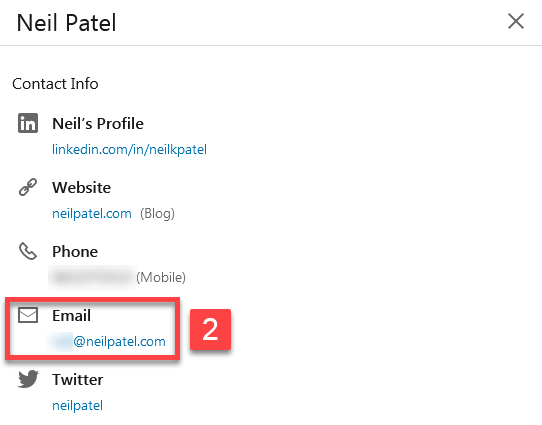 ​Make a list of people you want to contact and find their email address. Use the techniques described above to help you find their contact details. Before I let you go, something important. Don’t add people to lists (newsletters) they don’t ask to be on. It’s annoying and your brand will suffer the backlash. If you want to add them to your newsletter, ask them if they are interested and share how it can specifically help them. Ah Google Chrome, the amazing useful (for Google) spy tool that allows browser applications to run in the background when the browser is CLOSED and this is the DEFAULT setting.